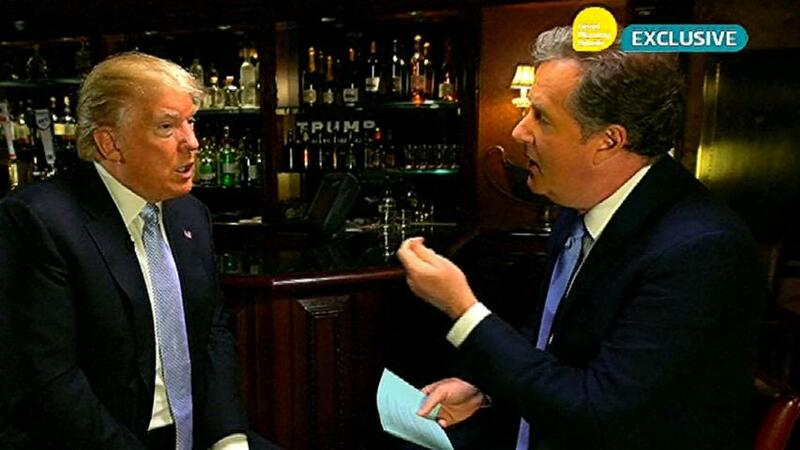 LONDON -- Donald Trump has hit back at criticism from Britain's leaders by describing himself in an interview with Piers Morgan as "not stupid" and a "unifier." The presumptive Republican nominee made the comments to Good Morning Britain, the breakfast show of NBC News' U.K. partner ITV. He was asked about comments by British Prime Minister David Cameron, leader of the U.K.'s Conservative Party, who said that Trump's suggestion Muslims should be barred from the United States was "divisive, stupid and wrong." Trump told Good Morning Britain that "it looks like we're not going to have a very good relationship," if he were to win the presidential election in November. "Number one, I'm not stupid, OK? I can tell you that right now -- just the opposite," he told Morgan, the former CNN talk-show host. "Number two, in terms of divisive, I don't think I'm a divisive person. I'm a unifier, unlike our president now I'm a unifier." In December, a week after the San Bernardino shooting in which 14 people were killed, Trump called for a "total and complete shutdown of Muslims entering the United States." Asked to clarify this position in Monday's interview, he said "millions of people were calling in saying, 'Donald Trump is right.'" In a September op-ed for CNN, then-Republican presidential candidate Jindal described Trump as "a shallow, unserious, substance-free, narcissistic egomaniac." "We can decide to win, or we can be the biggest fools in history and put our faith not in our principles, but in an egomaniac who has no principles," Jindal wrote. But following Trump's victory in the Republican presidential primary, Jindal offered a very tepid endorsement of the real-estate magnate. "I think electing Donald Trump would be the second-worst thing we could do this November, better only than electing Hillary Clinton to serve as the third term for the Obama administration’s radical policies," Jindal wrote in The Wall Street Journal. During his short-lived 2016 presidential bid, Perry called Trump a "cancer on conservatism" and criticized his inflammatory rhetoric about Mexican immigrants. "Demeaning people of Hispanic heritage is not just ignorant. It betrays the example of Christ," Perry said in his September concession speech. "We can enforce our laws and our borders, and we can love all who live within our borders, without betraying our values." But after Sen. Ted Cruz dropped out of the race last week, Perry quickly endorsed the presumptive nominee. "He is not a perfect man," Perry told CNN. "But what I do believe is that he loves this country and he will surround himself with capable, experienced people and he will listen to them." Last month, Paul said he would support Trump in a likely matchup between Democratic presidential frontrunner Hillary Clinton. But in the lead-up to the Iowa caucuses, the former presidential candidate wasn't as fond of Trump, comparing him to infamous Nazi propagandist Joseph Goebbels. "Donald Trump is a delusional narcissist and an orange-faced windbag," Paul said on Comedy Central. He added: "A speck of dirt is more qualified to be president." Toward the end of his 2016 presidential bid, Rubio unleashed a flurry of rhetorical attacks on Trump. Among other things, the Florida senator criticized Trump's hypocritical immigration policy prescriptions, joked about Trump urinating in his pants at a GOP debate, and questioned whether voters should hand "the nuclear codes of the United States to an erratic individual." But last month, Rubio began to shift tone. He said he would support any Republican candidate, including Trump, though he ruled out any interest in being Trump's vice president. Haley confirmed last week that she would "respect the will of the people" and would support Trump's candidacy. Haley's tune was less favorable in February, when she hit the primary campaign trail in her home state for Sen. Marco Rubio, prompting Trump's ire. "Bless your heart," Haley said, after Trump labeled her an embarrassment. Christie became the first major former presidential candidate to endorse Trump. But just a few months earlier, he was warning voters about Trump's preparedness for the office. "We do not need reality TV in the Oval Office right now," Christie said in December. "President of the United States is not a place for an entertainer." When Walker dropped out of the presidential race after just three months, the governor called on many of his Republican presidential rivals to do the same in order to consolidate support around a conservative candidate. The governor took a thinly veiled shot at Trump, criticizing the real-estate mogul's brash rhetorical style. "It has drifted into personal attacks. In the end, I believe that the voters want to be for something and not against someone," Walker said in his concession speech. "Instead of talking about how bad things are, we want to hear how we can make them better for everyone." Yet late last month, Walker signaled he'd support the GOP nominee against Clinton — though he refused to say Trump's name. Scott, a former Rubio endorser, said last week that he would support the Republican presidential nominee. Though Scott was not a particularly vocal critic of the real-estate magnate, he did condemn Trump's initial refusal to denounce an endorsement from the former leader of the Ku Klux Klan. "Any candidate who cannot immediately condemn a hate group like the KKK does not represent the Republican Party, and will not unite it," Scott wrote in a statement. "If Donald Trump can’t take a stand against the KKK, we cannot trust him to stand up for America against Putin, Iran, or ISIS." In an interview on Fox Business last year, Tillis, who recently said he would endorse Trump, characterized the former reality-television star's Republican-debate performance as "more entertainment" than policy. He also criticized the presumptive nominee's rhetoric for inciting violence at campaign rallies. "He has some responsibility for it," Tillis said of the violence at Trump's rallies. 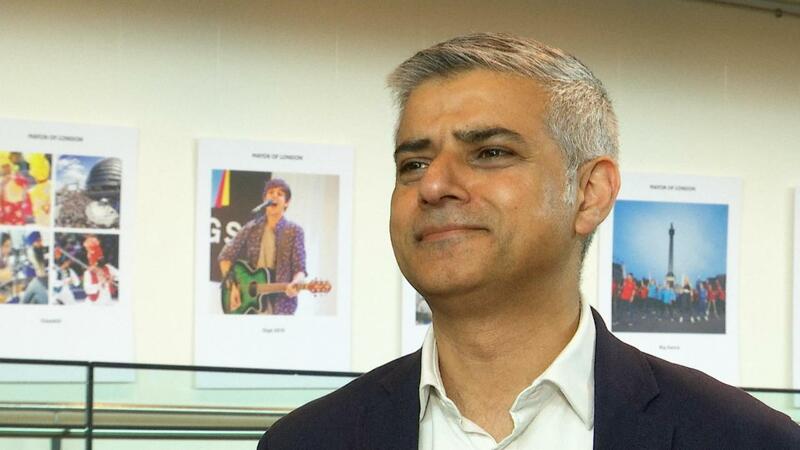 Khan -- a Muslim member of the U.K.'s opposition Labour Party -- said Trump's comments on Islam were "ignorant," adding that he hopes the Republican loses the election. "When he won I wished him well — now, I don't care about him," Trump told Good Morning Britain. "Let's see how he does, I mean let's see if he's a good mayor." Trump said Khan was "very rude," and added: "Tell him I will remember those statements, they're very nasty statements." Khan "doesn't know me, never met me, doesn't know what I'm all about," the real-estate mogul said.